I have worked on some projects that have been technically challenging, where I have been functioning well outside of my comfort zone. I was not a knowledge expert and had to rely on my team to guide and advise on the best way forward. Often I would find myself at a stalemate on a particular project issue and would have to use all of my influencing and negotiating skills to work with the “experts” to get them to talk to each other and come up with a practical solution. I think a big part of the success of a good project manager is the ability to use the soft people skills of knowing when and how to talk to people to get the best out of them. That is the most intriguing element of working with teams of very smart and passionate people. 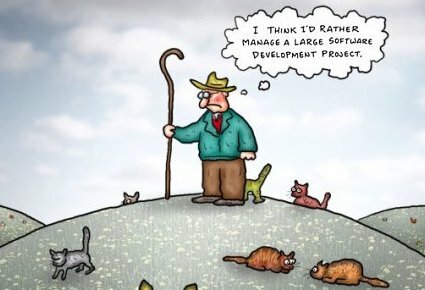 It does feel akin to herding cats at times but the dynamics of pushing the technical boundaries to deliver something that logic would define as impossible in the time and cost scale proposed is a stressful but exciting problem. In my experience stakeholders can be quite dogmatic about the perceived outcomes and unwilling to compromise, the technical team can be adamant that their solution is the best and the creative teams are passionate about how it all looks together. But the key to a good successful project manager is having a keen sense of when to question, when to challenge and when to compromise. I think a big part of the success of a good project manager is the ability to use the soft people skills of knowing when and how to talk to people to get the best out of them. That is the most intriguing element of working with teams of very smart and passionate people. It does feel akin to herding cats at times but the dynamics of pushing the technical boundaries to deliver something that logic would define as impossible in the time and cost scale proposed is a stressful but exciting problem. In my experience stakeholders can be quite dogmatic about the perceived outcomes and unwilling to compromise, the technical team can be adamant that their solution is the best and the creative teams are passionate about how it all looks together. But the key to a good successful project manager is having a keen sense of when to question, when to challenge and when to compromise. Having that sixth sense that what someone is telling you is not quite as dogmatic as it first appears. Of applying critical thinking to that problem asking focusing questions. What is the real issue? How will success be measured? What are the constraints? Who are the stakeholders? Examine past efforts…Learning from our mistakes and challenging the team to look at how the problem has been considered in the past? Are we just reinventing the wheel? What’s different this time? Most importantly what is limiting our thinking? Avoiding the zombie mentality, “well the brief says x, therefore, I am going to build/design/test it like that”. Without considering the full business case and looking at the problem from other perspectives. I see that a lot where people are not thinking outside of the box and only considering their segment, i.e. design, UX, IA, Front End, Back End etc. The role of the project manager in that instance is to challenge all those perspectives. Effectively blow up the business case, look at the technical difficulties, examine the revenue model. Why is something happening? Ask that down five different levels and eventually getting to the real why. Then understand the extent of your recommendations, the “so what’s”. The Pareto rule is great tool to help in this process, where focusing on 20% of the problems will solve resolve 80% of the complaints. At the heart of the project sits the project manager who needs to be the ambassador, diplomat, negotiator and the catalyst to move the project forward. Challenging the status quo where necessary but almost in an unseen way to bring out the best in the team. So at the end of the day, the stakeholders are wowed by the result, the development team have done their best work and the end user has an amazing experience that ticks all the right boxes. Previous story The four horses of the GDPR apocalypse: Great resources to understand the new legislation.